Putting Tom Hanks in front of the American flag and having him wax lyrical about the rights granted by the American Constitution can't help but recall Mr Smith Goes to Washington. Spielberg's Bridge of Spies lands firmly in the same liberal humanist territory; a noble Atticus Finch-a-like lawyer suffering the slings and arrows of public opinion as he defends an indefensible defendant to prove that, gosh darn it, everyone deserves due process. Even Commie spies. 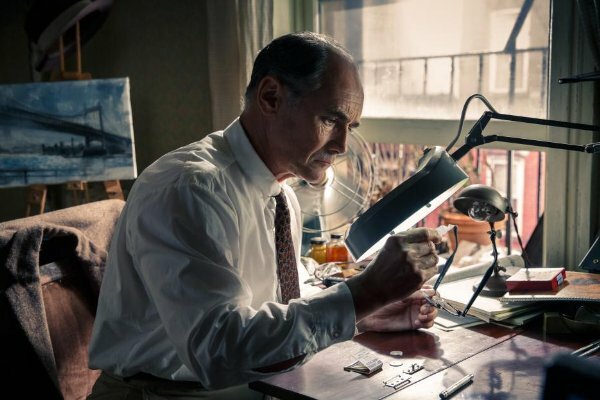 Said Commie Spy is Rudolf Abel (Mark Rylance), a taciturn painter who lives in Brooklyn and just happens to be passing military secrets to the Soviets. In the opening scenes we observe him going about his day as he's tracked by CIA agents. They arrest him and soon there's to be a hugely publicised trial. His legal counsel is the initially reluctant James Donovan (Tom Hanks), who knows full well what defending this man will entail for his reputation. A film of two halves, the courtroom drama eventually develops into Berlin-set Cold War intrigue. While piloting a U2 spy plane over Soviet territory, pilot Gary Powers (Austin Stowell) is shot down and captured. With a head full of espionage secrets, the US are determined to get him back before he cracks under interrogation, and decide to arrange a transfer of prisoners: Abel for Powers. Wary of an international incident, the US sends someone with no government ties - and so the personable Donovan is off to negotiate with the KGB. A Steven Spielberg film starring Tom Hanks is about as safe a bet as you can get in modern cinema. Donovan is the precise kind of quiet, dignified, intelligent and subtly playful character that Tom Hanks does so well, mixing in layers of rebelliousness, quick thinking and legal creativity that sit atop an impenetrable bedrock of principles. Spielberg similarly relishes material that, when you strip it back to its bones, is largely middle-aged men sitting in dowdy, smoke-filled rooms. There's clear shades of Lincoln in the way light hangs in the air as it pierces windows, or as low-wattage bulbs pick out the crags in these men's faces. Further directorial mileage comes in Spielberg's knack for locations; the hum and vigour of Brooklyn nicely contrasting with the monochrome iciness of Berlin - making it literally a 'cold war'. But, for all Spielberg and Hanks' expertise, the film occasionally feels like pre-baked Oscar bait - peppered with sledgehammer 'inspirational' moments where the score rises and Hanks solemnly intones the guiding principles of the founding fathers. Too much of that gloop would be a recipe for mediocrity - yet Bridge of Spies is saved by two factors. The first is a Coen Brothers authored script that subtly spins a thread of absurdity through the narrative. Moments like a gang of incredibly polite East German muggers, a puffed up GDR lawyer answering the wrong telephone or the appearance of a bizarre East German family feel deliciously playful. Bridge of Spies isn't straightforwardly Coenesque, but it's got enough of the same DNA inside to add a sprinkling of pizzazz. The other major thing it's got going for it is Mark Rylance's astonishing performance. Somehow he manages to make doing literally nothing fascinating. It's surreal how magnetic Rylance can be just standing silently, observing events through impossibly perceptive eyes. I've seen him on stage a number of times, yet cinema has never exploited his talents to the fullest until now. With Abel he seems a shoe-in for awards nominations - knotting together the twin poles of cool impassivity and intense charisma. While by no means a top flight Spielberg (or Hanks for that matter) movie, the 140 minute runtime breezily passes in a swirl of genuinely interesting historical minutia and rock-solid film-craft. There's even a couple of flashes of genuine panache - particularly a powerfully edited sequence showing schoolchildren absorbing the horrors of nuclear war via Duck and Cover. 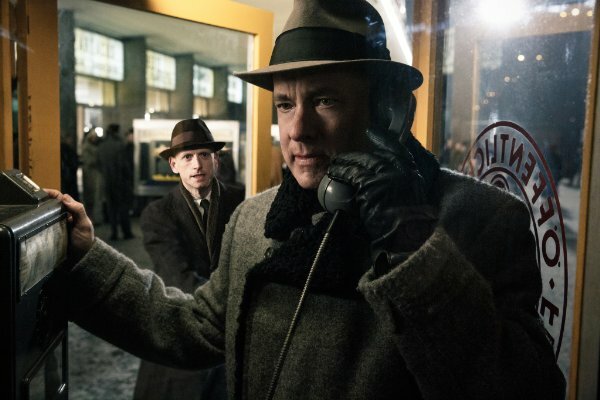 While not a milestone in anyone's careers, Bridge of Spies achieves its goals with laudably little fuss - worthy of admiration for unpretentious craftsmanship, humanistic intentions and just enough peculiarity to tease Coen fans. Worth a watch.